A Socioeconomic & Recreational Profile of Surfers in the U.S.
Surfers have historically been considered a fringe group and often marginalized or ignored compared with other sectors of coastal tourism and recreation. Surfing has now evolved into a multi-billion dollar industry but we know little about this segment of coastal users. Efforts seeking to describe current economics and demographics of surfers in the United States have been limited by lack of data. The Surfrider Foundation, with support from Surfing Magazine, created the Surf-First Surfer Survey to collect a national dataset on the recreational, demographic and economic characteristics of surfers. 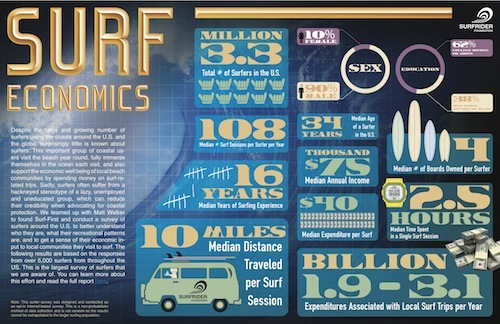 By collecting these data for surfers in the U.S., we develop national, regional, and area-specific profiles of surfers and describe their economic impacts. This information provides the first national characterization of surfers and assesses the economic contribution of surfer visits to specific locations. These results can inform coastal management decision-making and show that surfers are an important segment of the coastal tourism sector.